Ait Benhaddou Ouarzazate day trip: Day excursion from Marrakech to experience the history of old southern Morocco. 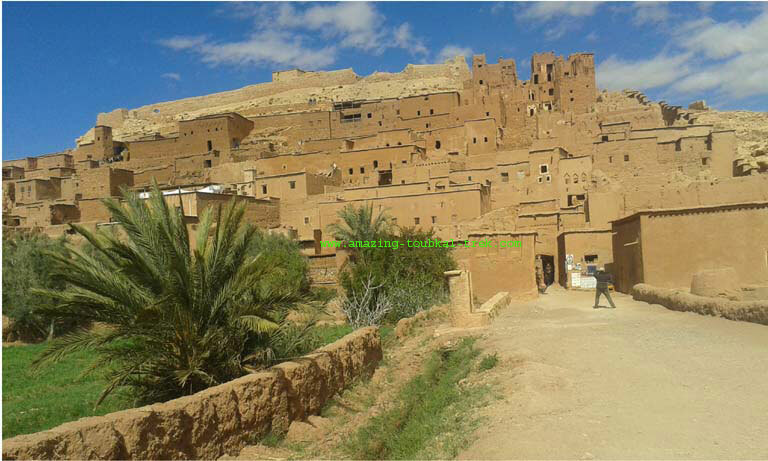 You will visit Ait Benhaddou Ksar, home of Gladiator film and Taourirt Kasbah in Ouarzazate. These sites offer a picturesque, an exemplary view of the Southern region’s old heritage. Ait Benhaddou is an exceptional old village where many movies were shot, which is on the UNESCO Heritage List. Ouarzazate offers its famous film studios, its magnificent Kasbah, Taourirt, and craft center too. – Visit 2 of the most famous kasbahs, Aït Benhaddou & Taourirt Kasbahs. – Enjoy the perfect nature and spectacular views of the Atlas Mountains. – Visit the famous Film Cinema studios in Ouarzazate. – Ait Benhaddou Ouarzazate day trip is available and can be arranged for groups of all sizes. Ait Benhaddou Ouarzazate day trip: Day excursion through the Atlas Mountains to explore the history of old Morocco. Ait Benhaddou Ouarzazate Day Trip, Day Excursion from Marrakech.